Review posted May 9, 2014. Groundwood Books/ House of Anansi Press, Toronto, 2013. First published in Montreal in 2012. 101 pages. Hélène is a girl who's relentlessly insulted. On the stall door of the second-floor washroom, on the blue staircase, in the schoolyard, on her locker door. So Hélène is not happy when she learns their whole class is going to be going to Nature Camp. "Four nights, forty students. Our whole class." She is not excited. She's scared and nervous. She goes with her mother to buy a bathing suit and looks like a sausage. On the bus, for comfort, she's reading Jane Eyre. Jane has a terrible childhood, but grows up clever, slender, and wise. But even Jane Eyre needs a strategy. At camp, Hélène uses the strategy of pretending to look for something in her suitcase, and ends up in a tent with the Outcasts. But some surprises happen at camp, including a close encounter with a fox. Things start to change for Hélène. 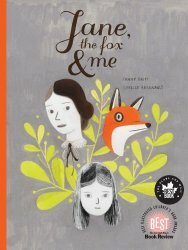 This graphic novel is a beautiful story of a sensitive and thoughtful girl going through relentless cruelty. And it ends well! Readers won't be able to help but cheer for Hélène as things change for her.